Joyce Lee's traveling snack incubator, Nibble, is a unique concept that's helping both brands and consumers. I also learned that Lee, a graduate of the MBA program at Kellogg School of Management at Northwestern University, is growing a unique pop-up retail concept that meets the needs of both customers and suppliers. 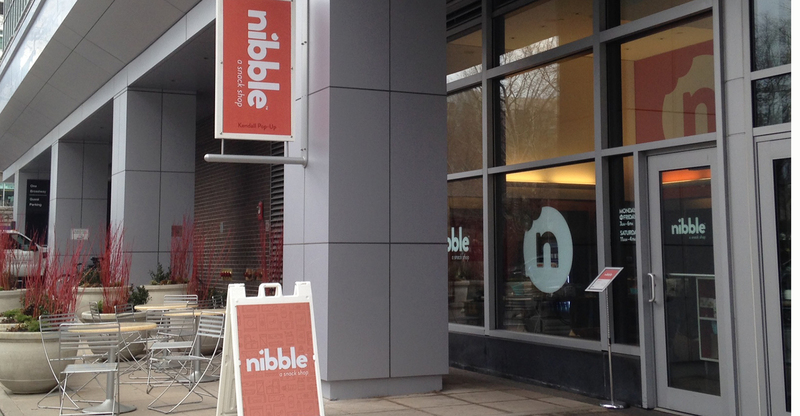 Open for just more than a year, Boston-based Nibble was founded on the fact that 90 percent of people snack at least once a day and that some people are “grazers” who snack on a more ongoing basis. Finding healthy and delicious snacking options can be difficult, especially for those with dietary restrictions and/or allergies. To meet this need, Lee started Nibble, a mobile retail store that regularly moves from location to location to offer snacks from small and startup manufacturers. They do not exclusively carry natural and organic products but find that most of their manufacturer partners are in the better-for-you category. A mobile store that is in a different location at least once a day has some size limitations. It also has no refrigerated or frozen products. Even so, it offers about 60 items from more than 30 brands at each of its stops. Nibble has ongoing partnerships with about 90 manufacturers and carries only brands with which it can have a personal relationship, learning the story and the passion that inspired the brand. When brands grow into a place of larger distribution, they do part ways, but do so celebrating that the brand has grown and graduated into the next phase of its development. Over time, Nibble has operated in more than 20 locations and is now receiving requests for both first-time and repeat visits to many sites. Some companies want to give employees access to healthier snacks and an experience beyond what is found in a vending machine, and ask Nibble into their location one or more times each month. With this strong and growing acceptance of her business model, Lee is considering adding the capabilities for additional mobile stores when the time is right. Lee has been able to share valuable lessons with her supplier partners. (She also has experience in both the CPG and restaurant industries.) Seeing her business as a “snack incubator,” she has provided many manufacturers with insights about their packaging, flavor profile, ingredient choices, shelf-life, etc. She not only helps them with the product being sold at Nibble but prepares them for success in larger retail formats as they grow. With this in mind, Nibble only works directly with each brand, rather than buying product at wholesale. As most Nibble brands are just beyond the “farmers market” stage, they are not ready for broader distribution yet. Lee and her team—she has one other person working full time with her and several part-time employees—have developed strong connections, truly becoming “brand ambassadors” in the marketplace. The depth of partnership shared with their suppliers shows the value of building quality relationships between retailers and manufacturers. The more that they both know about each other, the more that they both can benefit. Know your customers. Nibble has learned that some products sell well at one location and not at another. She believes that these differences exist because differing demographics, such as age groups, at each location. Because of its limited retail space, Nibble must pay close attention to the movement of products and focus on what is popular at each location. Retailers, even those with fixed locations, should emulate this attention to customer preferences. National trends may not be indicative of what sells at every retail location. Pay attention to what sells and what doesn’t, and act accordingly. Sell with story. For every brand at Nibble, Lee has learned the story of the brand, what inspired it, where it came from and why people should try it. She is not just selling snacks but sharing the vision and heart of the people behind each snack. This, along with the quality of the snacks themselves, helps customers feel good about the snacks that they are eating. A big part of the mission at Nibble is customer education. This should resound with every natural retailer. There is a story behind every brand. The more that you tell that story, the more customers you create. Add to the basket. Snacks are a “gateway” item. If people find that items with natural, organic, fair trade or other distinctive ingredients taste good, how many other items might they be willing to try? Every item at Nibble can be sampled in advance and will be replaced if the customer is not happy with it. Again, a great retail practice, especially for retailers working to cultivate loyal and consistent shoppers. Can common items like snacks—or other commodities that are consumed daily—be used to draw in customers who will eventually shop more and more of your store? There is a lot to consider from what Lee is doing at Nibble and by how she is doing it. I, for one, am going to ponder it a bit more, while enjoying a snack. Catch Joyce Lee at Natural Products Expo East.